Jean-Antoine Watteau (b. Valenciennes, France, (Baptism) October 10, 1684 - d. Nogent-sur-Marne, France, July 18, 1721), French Rococo painter. Peter Paul Rubens was the main influence on Watteau's formative years. 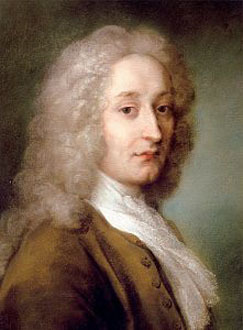 In 1717, Watteau joined the Academy of Painting. Some of his masterpieces are: Gilles and his Family (1716), Embarkation for Cythera (1717–19), The Mezzetin (1717–19) and L'Enseigne de Gersaint (1720). Watteau is now regarded as a forerunner of the Impressionists in his handling of color and study of nature. Les Plaisirs du bal, 1717. Watteau - Biography Written by Lisa MacDonald especially for the Artchive. This page was last modified on 12 May 2017, at 16:46.